We have added the two-factor authentication option using one-time passwords, which improves protection of accounts against unauthorized access. In order to enable the two-factor authentication, launch the MetaTrader 5 mobile application. Log in and choose the One-time password (OTP) generator option in the Settings window. The OTP generator can bind all your trading accounts and automatically generate a unique one-time six-digit password for each account. Enter this password when logging in to the web platform. Another new option allows changing the master and investor passwords. Take this opportunity to create an easy-to-remember personal ID. Also, the updated web platform can automatically generate demo accounts. Now, you can launch the MetaTrader 5 Web platform from any browser and start trading Forex, Stocks or Futures financial instruments immediately. The order of entries in the terminal and MetaEditor journals has changed. Before the update, the latest log entries were featured first. Now the oldest entries are shown in the beginning of the journal. A more conventional reverse sorting order makes reading the journal easier. In addition, it is now possible to hide the 'Time' and 'Source' columns using the journal context menu. In the hedging mode, the ticket of a closed position is now displayed for the orders and deals in the trading history. This makes it easier to find related opening and closing operations. Fixed an error that caused copying of SL/TP from an existing position to a new position on the same instrument. The error could occur when using One Click Trading functions (for example, from the chart or from the Market Watch window) in the hedging mode. Fixed display of arrow objects on ultra-high-definition screens (4K). A new ArrayPrint function has been added, which prints simple types and structures to the array log. ArrayPrint does not print all fields of a structure array to logs – array fields and pointer fields of objects are skipped. If you want to print all fields of a structure, you should use a custom function for the mass printing with a desired formatting. The behavior of the ArrayResize function has changed. If -1 is passed as the reserve_size parameter, the function only releases unused (reserved) memory if the function does not increase the array size. Setting the new array size to 0 with reserve_size=-1 is equivalent to the ArrayFree call. The new behavior allows optimizing memory usage in MQL5 programs. Chart drawing functions have been added to the Standard Library. 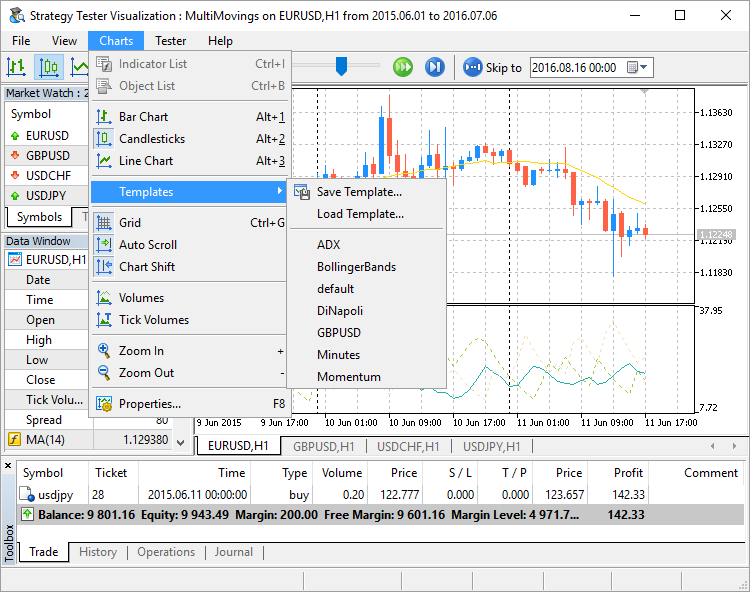 To use the new functionality, include MQL5\Include\Graphics\Graphic.mqh to your project. Updated functions for working with mathematical statistics in the Standard Library. We have thoroughly checked the quality and accuracy of all functions both in the MQL5 version and in the source R language. Unit tests are distributed along with the static library; the tests enable control over the accuracy and performance speed. They are available in the directory \MQL5\Scripts\UnitTests\Stat. The updated version features advanced settings for configuring execution delays during testing. Now you can test your Expert Advisors in a variety of trading conditions, including the ideal case without a delay and any custom set delay. Only the random delay mode was available in earlier versions. Fixed generation of the tick volume of bars in the 'M1 based OHLC' mode. Fixed specification of order and position opening time up to milliseconds when trading in the hedging mode. Fixed "old tick" error, which could appear during multi-currency or multi-timeframe testing in the 'real ticks' mode. Improved CopyTicks performance speed when the requested ticks are read from a database located on a disk. The file context menu in the Navigator and in the toolbox now features commands for working with the versioned source code repository MQL5 Storage. Fixed an error that could occasionally break the integrity of the local MQL5 Storage database when working with more than 1024 files in the repository. Fixed display of the file tree of MQL5 Storage. Fixed file display after a mass text replacement. Improvements of the One Click Trading panel on the chart: it is now also available in the portrait mode; trade volume can be quickly changed by selecting a desired value from the list. The chart symbol can now be changed by tapping on the symbol name in the window header. Improvements in the app settings section: now it features information about the current account, properly arranged units, and improved designed. Added tooltips for the Buy, Sell and Close buttons in trade dialogs. The tooltips contain information about the security to be bought or sold during the operation, to help beginners understand the trading process. Added new icons of orders, deals and positions in the "Trading" and "History" tabs. The updated terminal provides optimized and much faster (up to 4-5 times) display and update of the Market Depth, of the tick chart in the Market Depth, and of the Time & Sales data. Fixed synchronization of tick history during non-trading hours. The process could consume an excessive amount of network traffic in some cases. An MQL5 version of the ALGLIB numerical analysis library has been included into the Standard Library. Mathematical statistics functions have been included into the Standard Library. MQL5 now provides the functionality of the R language, which is one of the best tools for statistical data processing and analysis. Options for operations with statistical distributions: normal distribution, lognormal distribution, beta distribution, etc. The detailed description of the library functions is available in the article Statistical Distributions in MQL5 - Taking the Best of R.
The MQL5 version of the Fuzzy library has been included into the Standard Library. The Fuzzy library implements Mamdani and Sugeno fuzzy inference systems. New property CHART_QUICK_NAVIGATION allows enabling/disabling quick navigation bar in the chart. If you need to modify and access the property state, use the ChartSetInteger and ChartGetInteger functions. The navigation bar is opened by pressing Enter or Space. It allows you to quickly move to the specified date on the chart, as well as to switch symbols and timeframes. If your MQL5 program processes Enter or Space key pressing, disable the CHART_QUICK_NAVIGATION property, in order to avoid interception of these events by the terminal. The quick navigation bar can still be opened by a double click. New functions FileLoad and FileSave have been added. They provide an easy method to read and save arrays to files. Unlike FileRead* and FileWrite*, these functions do not require the indicator handle. FileLoad and FileSave operate with arrays of numeric types, as well as with simple structures that do not have strings, dynamic arrays or class objects. Modified display of custom indicators with the DRAW_CANDLES drawing mode. Now it is possible to set from one to three colors for this mode. The display of candlesticks depends on how many colors are set. If one color is specified, all candlesticks on the chart will be fully painted in this color. If two colors are specified, one color is used for candlestick edges, the other one is used for the body. If three colors are specified, one color is used for candlestick edges, two other colors are used for the bodies of bullish and bearish candlesticks. Fixed bugs and improved operation with the tick history using CopyTicks functions. Starting with the new build, operators can be used in interfaces (was not allowed before). Fixed an error that could lead to the repeated request to sign in to MQL5.community when buying products from the Market. Added UI translation into Greek, Malay and Hebrew. Optimized the code to increase the overall web terminal operation speed. Account initialization, adding symbols and trading itself are now performed even faster. The platform supports the multi-window mode allowing traders to monitor price changes on multiple symbols simultaneously. Added the ability to edit indicator levels. The interface is translated into Bulgarian. Implemented the new algorithm of forming the Exposure tab for an exchange market. Now, the platform adapts the display of assets depending on the risk management system applied to a trading account: Retail Forex, Futures or Exchange model. We have bought and sold 100 000 GPB simultaneously. We have 0 GBP, and the Assets tab does not display this currency. As of USD, we gave a currency in one case and received it in another. The Assets tab calculates the final outcome and adds it to the current balance since the deposit currency is USD as well. JPY participated in two deals meaning that the tab displays its total value. Fixed deal type display in the history of trading operations. Terminal: Fixed repeated risk notification window display when re-connecting to a trading account. Optimized and fixed working with the trading symbol selection dialog in case of a large number of symbols (several thousands and more). Fixed display of levels of built-in indicators calculated based on Moving Average (Bollinger Bands, Adaptive Moving Average, etc.). Previously, an error occurred when plotting indicators in a separate subwindow. Fixed an error that could occasionally interfere with placing a futures contract order in case an order price coincides with the upper or lower contract price limit. Optimized and accelerated compilation of MQL5 applications. Added support for 'final' and 'override' modifiers for classes, structures and functions. The presence of the 'final' modifier when declaring a structure or a class prohibits the further inheritance from it. If there is no need to make any further changes in the class (structure) or such changes are unacceptable for security reasons, declare that class (structure) with the 'final' modifier. In this case, all class methods are also implicitly considered 'final'. But the argument type is mistakenly changed from 'int' to 'short'. In fact, the method overload instead of overriding is performed in that case. While acting according to the overloaded function definition algorithm, the compiler may in some cases select a method defined in the base class instead of an overridden one. In order to avoid such errors, the 'override' modifier should be explicitly added to the overridden method. The 'final' modifier acts in the opposite way — it disables method overriding in derived classes. If the method implementation is self-sufficient and fully completed, declare it with the 'final' modifier to ensure it is not changed later. Fixed compiling template functions with default parameters. Fixed a few errors in sorting Market products. Fixed updating the current market prices for open orders and positions in the visual testing mode. Removed slippage during Buy Limit and Sell Limit order execution when testing using exchange symbols. Fixed occasional generation of incorrect prices in "Open prices" testing mode. Fixed generation of OnTradeTransaction events when testing. When testing based on real ticks, the data on the mismatch of tick prices (bid or last depending on the price used to generate a bar) and low or high values of the existing minute bar appears in the tester log. Fixed displaying the data profiling in source code files. It is now much easier to transfer SSL certificates from the desktop platform to the mobile one. You no longer need iTunes to do that. MetaTrader 5 allows you to add an extra protection to your account by using a certificate. Without the certificate, connection is impossible. If the certificate was created in the desktop version, you should transfer it to be able to enter your account via a mobile device. To do this, open a desktop platform, right-click the necessary account in the Navigator window, and select Transfer. Set the certificate password which is known only to you, open the mobile platform, and connect to your account. You will be immediately offered to import the certificate. Besides, the latest version features the migration dialog for accounts transferred from MetaTrader 4. If your account has been transferred to the 5th generation platform, you are warmly greeted, provided with information on the new features, and offered to change your password. Now certificates used for the advanced security connection can be conveniently transfered from the desktop platform to mobile terminals. The trading platform supports extended authentication by protecting a trade account using an SSL certificate in addition to a password. The certificate is a file that is individually generated for an account on the trade server. This file is unique, and account connection is not possible without the certificate. In the earlier platform versions, any certificate requested and generated from the desktop terminal needed to be manually copied and installed on the device to enable use of the trading account from the MetaTrader 5 Mobile for iPhone/iPad or Android. Now, certificates can be conveniently transfered. A certificate is first encrypted on the desktop terminal: the account owner sets the password for certificate encryption using the secure AES-256 algorithm. This password is only know to the user, while it is not sent to the server. Further, the encrypted certificate is sent to the trade server, where it is stored until the mobile terminal receives it, but no more than one hour. Certificate transfer process is secure: the trade server is only used as an intermediate storage, while the certificate is encrypted on the client's side. The certificate password is not transmitted to or stored on the trade server. Enter the master password of the account to confirm that it belongs to you. Next, set a password to protect the certificate before sending it to the server. Set a password that has at least 8 digits. After successfully sending the certificate to the server, open the mobile terminal and connect to your account. You will immediately be prompted to import the certificate. Confirm and enter the password that you have set from the desktop terminal. You can view the imported certificate in the "About — Certificates" section. 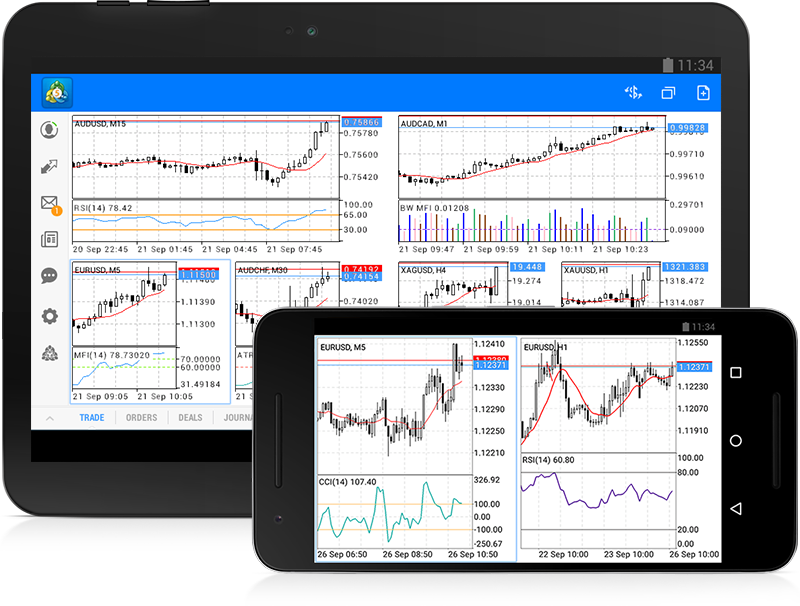 Updated MetaTrader 5 Platforms for iPhone/iPad and Android supporting certificate transfer will be released soon. An updated algorithm for the execution of pending orders, as well as SL ans TP, which provides more accurate testing conditions. Advanced options of visual testing. A trigger for Stop-Orders of exchange instruments is the Last price. So the Last price=72580 received in the stream activates the Buy Stop order. In the earlier versions, the same price would be used to execute this order. This behavior is incorrect, because there is no Ask=72580 in the market to execute the Buy transaction. The current Ask=72590 is used in the updated tester version, so the Buy Stop order is executed at this price. The new trade execution algorithm in the Tester is closer to real market conditions. The trade operation would be executed at a non-market price when using the previous algorithm, which would lead to inaccurate testing results. The algorithm has not changed for other instruments: Bid/Ask prices are used for all types of pending orders, as well as for SL and TP. However, the execution mode has changed: in earlier versions, orders were executed at the price specified in the order. Now market Bid and Ask prices as of the time of order activation are used. During visual testing, the bar's High Ask and Low Bid price lines are now shown in the tester. On such charts, it is more convenient to test Expert Advisors that trade exchange instruments, because bars of such instruments, as well as order triggering are based on the Last prices, while market operations are executed at Bid and Ask prices. Fixed behavior of the CopyTicks function: it could return fewer ticks than was requested. Fixed generation of template functions. We have added the second accounting system — hedging, which expands the possibilities of retail Forex traders. Now, it is possible to have multiple positions per symbol, including oppositely directed ones. This paves the way to implementing trading strategies based on the so-called "locking" — if the price moves against a trader, they can open a position in the opposite direction. With this system, you can have multiple open positions of one and the same symbol, including opposite position. In addition to hedging support, the new platform version provides wider opportunities for migrating accounts from MetaTrader 4. Now, brokers can automatically transfer accounts to MetaTrader 5, including all operations: open and pending orders, and complete trading history. A welcome dialog appears when first connecting to the account migrated from MetaTrader 4. Data transmission is securely encrypted during migration. To get started, specify the password of your account that you used in MetaTrader 4, and then set a new password. Once connected, you will be able to continue using your account, just as if it has been opened in MetaTrader 5. The complete history of all trades from MetaTrader 4 is automatically added to the new account. The tickets of orders and positions (including history orders) are not preserved during import, because one history record from MetaTrader 4 can be imported as up to 4 history operations in MetaTrader 5. New tickets are assigned to all trading records. The account numbers can be preserved or replaced depending on how the broker imports them. Added the Chat. Now, you can communicate with your MQL5.community friends and colleagues. The chat displays all personal messages from your MQL5 account. To start communicating, log in to your account directly from the chat window or via the platform settings: Tools -> Options -> Community. Simplified demo account creation dialog, added ability to create hedge accounts. You do not have to fill the large form any more. Simply specify basic data and select trading parameters: account type, deposit, leverage, and hedging ability. Added automatic allocation of a demo account for quick start. If the platform has no accounts yet, a demo account on the first available trade server is allocated during the launch. After successful opening, connection to the account is established immediately. Now, each position has a ticket — a unique number. It usually matches the ticket of an order used to open the position except when the ticket is changed as a result of service operations on the server, for example, when charging swaps with position re-opening. A ticket is assigned automatically to all available positions after the terminal update. Fixed setting Stop Loss and Take Profit levels when placing a market order leading to a position reversal. Until recently, no appropriate levels were set for a new position. Fixed displaying prices with four and more decimal places on the one-click trading panel elements. Fixed displaying news in the print preview window. Fixed opening the Market Depth after the terminal emergency shutdown. Added a check if market orders are allowed when displaying one-click trading panel control elements. Optimized profit and margin calculation in case of a large number of open orders and positions. Fixed display of graphical objects in the "Chart on foreground" mode. Added ability to test trading robots and technical indicators in real tick history. Tick data has greater size compared to minute one. Downloading it may take quite a long time during the first test. Downloaded tick data is stored by months in TKC files in \bases\[trade server name]\ticks\[symbol name]\. When testing on real ticks, a spread may change within a minute bar, whereas when generating ticks within a minute, a spread fixed in the appropriate bar is used. If the Market Depth is displayed for a symbol, the bars are built strictly according to the last executed trade price (Last). Otherwise, the tester first attempts to build the bars by Last prices, and in case of their absence, uses Bid ones. OnTick event is triggered on all ticks regardless of whether the Last price is present or not. Please note that trading operations are always performed by Bid and Ask prices even if the chart is built by Last prices. For example, if an Expert Advisor using only bar open prices for trading (i.e., the built-in Moving Average) receives a signal at Last price, it performs a trade at another price (Bid or Ask depending on the direction). If "Every tick" mode is used, the bars are built by Bid prices, while trades are performed by Bid and Ask ones. The Ask price is calculated as Bid + fixed spread of a corresponding minute bar. If a symbol history has a minute bar with no tick data for it, the tester generates ticks in the "Every tick" mode. This allows testing the EA on a certain period in case a broker's tick data is insufficient. If a symbol history has no minute bar but the appropriate tick data for the minute is present, these ticks are ignored. The minute data is considered more reliable. Testing on real ticks is available not only on local and remote agents, but also through the MQL5 Cloud Network. Optimization of a strategy that could take months, can be completed in a few hours using the computing power of thousands of computers. Tests on real ticks using the MQL5 Cloud Network can consume a lot of data. This can significantly affect the payment for the use of the network power. Fixed an error that hindered the calculation of commission on several trading symbol types. Fixed filling Expert field for trading orders resulting from SL/TP activation according to the Expert field of the corresponding position. Previously, it was not filled. Fixed switching to usual and forward optimization results' tabs. Fixed calculation and display of the "Envelopes" indicator. Optimized trading operations during high-frequency trading. Now, history synchronization is not performed if a request for non-critical symbol's properties (not requiring the current quotes) has been made. For example, SYMBOL_SELECT, SYMBOL_DIGITS, SYMBOL_SPREAD_FLOAT, SYMBOL_TRADE_CALC_MODE, SYMBOL_TRADE_MODE, SYMBOL_TRADE_STOPS_LEVEL, SYMBOL_TRADE_FREEZE_LEVEL, SYMBOL_TRADE_EXEMODE, etc. Previously, the non-critical symbol history was synchronized at any request for its property. Fixed calculation of swaps as a percentage per annum. The format of the executable EX5 files has changed to implement the new features of the MQL5 language and the new hedging option in MetaTrader 5. All EX5 applications compiled in previous builds of MetaEditor will work properly after the update, i.e. the upward compatibility is fully preserved. EX5 programs compiled in build 1325 and above will not run in old terminal builds - backward compatibility is not supported. Abstract classes are used for creating generic entities that you expect to use for creating more specific derived classes. An abstract class can only be used as the base class for some other class, that is why it is impossible to create an object of the abstract class type. position — position ticket. Fill it when changing and closing a position for its clear identification while trading in hedging mode. In the netting system, filling the field does not affect anything since positions are identified by a symbol name. position_by — opposite position ticket. It is used when closing a position by an opposite one (opened at the same symbol but in the opposite direction). The ticket is used only in the hedging system. Added TRADE_ACTION_CLOSE_BY value to the ENUM_TRADE_REQUEST_ACTIONS enumeration of trading operation types — close a position by an opposite one. The ticket is used only in the hedging system. Added ORDER_TICKET property to ENUM_ORDER_PROPERTY_INTEGER — order ticket. Unique number assigned to each order. Added DEAL_TICKET property to ENUM_DEAL_PROPERTY_INTEGER — deal ticket. Unique number assigned to each deal. Added POSITION_TICKET property to ENUM_POSITION_PROPERTY_INTEGER — position ticket. Unique number assigned to each newly opened position. It usually matches the ticket of an order used to open the position except when the ticket is changed as a result of service operations on the server, for example, when charging swaps with position re-opening. To find an order used to open a position, apply the POSITION_IDENTIFIER property. POSITION_TICKET value corresponds to MqlTradeRequest::position. Added ORDER_TYPE_CLOSE_BY value to the ENUM_ORDER_TYPE order type enumeration — close by order. Added ORDER_POSITION_BY_ID value to the ENUM_ORDER_PROPERTY_INTEGER order property enumeration — opposite position identifier for ORDER_TYPE_CLOSE_BY type orders. Added DEAL_ENTRY_OUT_BY value to the ENUM_DEAL_ENTRY deal direction enumeration — a deal is performed as a result of a close by operation. Added PositionGetTicket function — return a position ticket by an index in the list of open positions and automatically select that position for further work using the PositionGetDouble, PositionGetInteger, and PositionGetString functions. Added PositionSelectByTicket function — select an open position for further work by a specified ticket. Added SYMBOL_MARGIN_HEDGED value to the ENUM_SYMBOL_INFO_DOUBLE trade symbol property enumeration — size of a contract or margin for one lot of hedged positions (oppositely directed positions at one symbol). If the initial margin (SYMBOL_MARGIN_INITIAL) is specified for a symbol, the hedged margin is specified as an absolute value (in monetary terms). If the initial margin is not set (equal to 0), a contract size to be used in the margin calculation is specified in SYMBOL_MARGIN_HEDGED. The margin is calculated using the equation that corresponds to a trade symbol type (SYMBOL_TRADE_CALC_MODE). Margin calculation for hedged positions is described in details in the MetaTrader 5 trading platform Help. ACCOUNT_MARGIN_MODE_RETAIL_NETTING — used for the over-the-counter market when accounting positions in the netting mode (one position per symbol). Margin calculation is based on a symbol type (SYMBOL_TRADE_CALC_MODE). ACCOUNT_MARGIN_MODE_EXCHANGE — used on the exchange markets. Margin calculation is based on the discounts specified in symbol settings. Discounts are set by the broker, however they cannot be lower than the exchange set values. ACCOUNT_MARGIN_MODE_RETAIL_HEDGING — used for the over-the-counter market with independent position accounting (hedging, there can be multiple positions at a single symbol). Margin calculation is based on a symbol type (SYMBOL_TRADE_CALC_MODE). The hedged margin size (SYMBOL_MARGIN_HEDGED) is also considered. Fixed return of the SendFTP function call result. Previously, FALSE was returned after a successful sending instead of TRUE. MQL5: Fixed an error in StringConcatenate function that occasionally caused "Access violation" execution error. Fixed a few errors occurred when working with template functions. Added ability to display lines exceeding 4000 characters for Print, Alert, and Comment functions. Fixed an error in ArrayCompare function that occurred when comparing an array to itself but with different initial position shift from the beginning. SelectByMagic — select position by a magic number and symbol for further work. SelectByTicket — select position by a ticket for further work. RequestPosition — receive a position ticket. RequestPositionBy — receive an opposite position ticket. PositionCloseBy — close a position with the specified ticket by an opposite position. SetMarginMode — set margin calculation mode according to the current account settings. PositionClose — close position by ticket. PositionModify — modify position by ticket. MarginMode — receive margin calculation mode. Until recently, the method worked similarly to the new StopoutMode method. MarginDescription — receive margin calculation mode as a string. Until recently, the method worked similarly to the new StopoutModeDescription method. StopoutMode — receive minimum margin level specification mode. StopoutModeDescription — receive minimum margin level specification mode as a string. SelectPosition — select a position for further work. Added a few improvements to the Standard Library. Added support for template class constructors. Fixed a few trading signals showcase display errors. In order to expand possibilities of retail Forex traders, we have added the second accounting system — hedging. Now, it is possible to have multiple positions per symbol, including oppositely directed ones. This paves the way to implementing trading strategies based on the so-called "locking" — if the price moves against a trader, they can open a position in the opposite direction. Currently, testing and optimization on real ticks are possible only on local and remote agents. Support for MQL5 Cloud Network will be added in the near future. Added PositionGetTicket function — return a position ticket by an index in the list of open positions and automatically selects that position for further work using the PositionGetDouble, PositionGetInteger, and PositionGetString functions. Fixed an error in StringConcatenate function that occasionally caused "Access violation" execution error. Update the platform right now to see how the hedging option works. When opening a new demo account, enable the \"Use hedge\" option. The option will be available if your broker's server has already been updated and configured.